Barren ground caribou are also known as the tundra caribou. They inhabit the northmost ranges of caribou, and undertake large-scale seasonal migrations from northern calving grounds and pastures to wintering range in the boreal forests and back. Hunting opportunities are mostly concentrated in Greenland and Alaska, with some options in Canada as well. The most affordable barren ground caribou offers are to be found in Greenland, where they get below $5,000. Barren ground caribou hunts in the USA and Canada start at about $7,500 and most are in the 10,000 USD range. As a large part of the price comes from the cost of travel to remote areas, it’s advisable to combine a hunt after caribou with hunting other species such as musk ox or moose. Combination hunts typically are a better value. It’s amazing how creatures can adapt to living in the harshest of environments. You’d never thought that something as unappetizing and unnourishing as lichen can support tens of thousands of robust and hard-going deer. Yet, here they are, all over the Northern Hemisphere: known as reindeer in Eurasia and as caribou in North America, the Arctic deer is the source of life for many indigenous peoples, and an irresistible attraction for hunters from the developed countries. When to hunt Barren Ground Caribou? The season in Alaska runs from August to November, but the prime time for hunting is September and October. The same applies to Greenland. In North America success in hunting barren ground caribou often depends on whether the animals migrate to a given area or not. The populations in Greenland hardly ever migrate at all, so hunting is somewhat more predictable there. Barren ground caribou hunting in Alaska is typically a combination of spot-and-stalk and ambushing a moving herd, especially during migration. In Greenland many outfitters prefer to cruise along the shoreline in motorboat, scouting for a huntable bull; once such is located, the guide and hunter land ashore and begin the stalk. This method is allowed and practiced in some areas of Alaska as well. One person's staple food (clothes, home, tools, and 1001 other use), another person's adventure magnet: the caribou. Like all caribou, barren ground caribou carry large and impressive antlers, that are uniquely shaped and combine palms with points, with a prominent eye guard. But for the true hunter they are only a symbol of the journey into the last frontier, the unique experience of joining the Circle of Life and Death in the rugged and beautiful Arctic, with the sight of thousands of migrating caribou rivalling the famous springbok migrations in Africa. 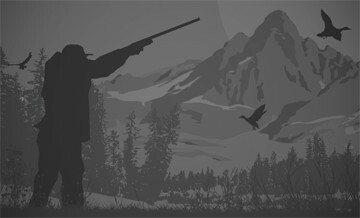 The 8 day two Caribou/Grizzly hunt will be booked as a medium difficulty backpack hunt on 2x1. We will plan on being in areas of less exposure to weather. Spike camp will be carried by the client and guide, usually on a through-hike (not coming out the same way they went in). The clients will need to be in top physical and mental shape. In the Arctic, one guarantee is by mid-September the mountain creeks have begun to freeze (if not already), storms have became more violent and higher elevation air strips are threatened by snow. Temperatures are generally in the 20 to 45 degree range. Along with the storms comes poor visibility, high river crossings and delayed travel. These times are mentally challenging for most hunters. Good Kavik Camp communication and high quality gear while in Spike Camp allows us to be patient and comfortable while waiting for better weather. During the later hunts, there are definitely fewer people out and about resulting in less traffic in the main valleys. Also animals seem to start moving out of high elevation areas that they have been in most of the summer and travel into transition areas lower down in elevation. Our packs will be approximately 60 lbs each. This will allow the guide to carry additional 100 lbs of game meat out and the hunter with 50 lbs of cape and horns. Air support will be utilized for pick up on a braided gravel bar of at least 500 ft. with a good approach. Hunting License and tags not included in above prices. Our company sells tags but you can also purchase at http://www.adfg.alaska.gov. For an additional fee of $3000 you can request your own packer to aid with your entire hunt. We have full time butcher to cut, grind and vacuum seal your game. Additional species on a trophy fee basis while on the hunt. The indicated price is for two hunters.